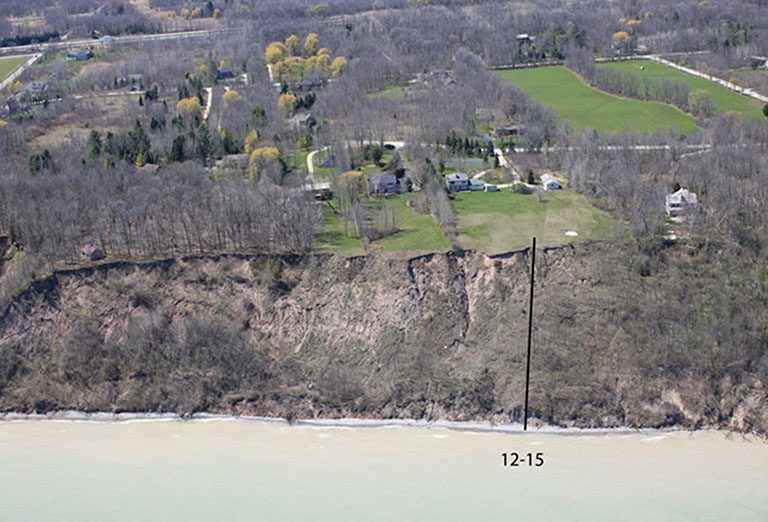 Much of the Lake Michigan shoreline in Wisconsin has a coastal bluff varying in height from less than 20 feet to over 140 feet. These bluffs erode in a number of ways and at varying rates (Figure 1). Over 175 profiles of these bluffs were measured and analyzed for slope stability in the mid-1970s and again in the mid-1990s. These profiles were measured with a hand held inclinometer and tape and are stored as XY plots on paper. These profiles were also located as accurately as possible on aerial photos, but they were not located in a GIS. Our challenge was to re-measure these bluff profiles in a relatively short time and on a small budget so that we could document the changes that have taken place on the bluffs during the last 40 years and to use this input as a basis to determine bluff stability over time. 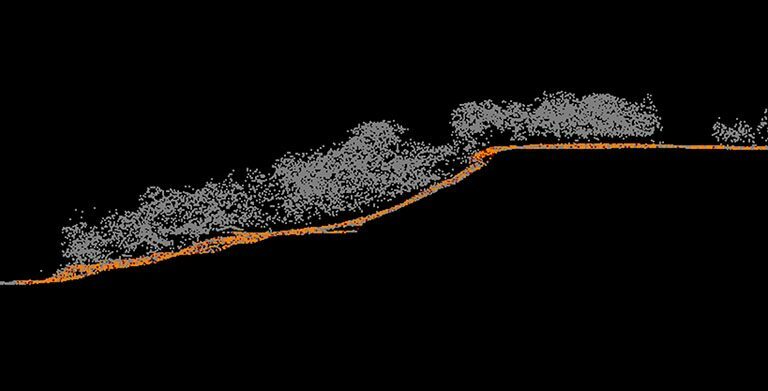 To achieve this goal we obtained and processed 2012 USACE LIDAR data for much of Wisconsin’s Lake Michigan shore. Using LP360 for ArcGIS (QCoherent Software, LLC) we re-projected to a Wisconsin coordinate system and performed verification of LIDAR classification quality (e.g. bare earth, trees, buildings). LP360 also allowed for rapid drawing of profiles from bluff top to lake edge. Correctly classified LIDAR points easily allow the separation of bare earth and other features such as trees and buildings. Figure 2a shows a profile with vegetation included and Figure 2b shows the ground surface with vegetation filtered out and a line draped to the surface to make it more easily visible. Figure 4 - Example of Excel file of bluff elevation and distances. The data column has been truncated. These files are used for the factor of safety calculations. A total of 175 profiles have been constructed from the 2012 LIDAR data. Of these, 105 profiles were in the same location as a profile that was measured in 1995. In order to compare slope stability in 1995 and 2012, we are in the process of analyzing them for factor of safety. Slopes can fail (have a landslide) on various surfaces. Our analysis is done to find the 10 most likely failure or rupture surfaces in a given slope. Of these, the one with the lowest safety factor is most likely to fail. 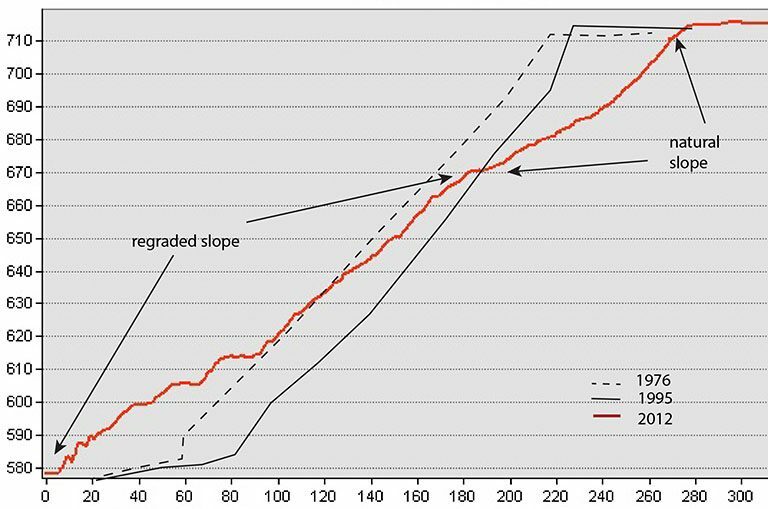 If the lowest factor of safety is above 1.00 then it is generally assumed that the slope is reasonably stable. The higher the lowest factor of safety the more stability there is. If the factor of safety is below 1.00 the slope is considered unstable and likely to fail. The factor of safety cannot predict when failure will take place, but that it is likely at some point in the future under existing conditions. We are still attempting to find the engineering properties used when the 1976 profiles were reanalyzed 1995. We also have about 20 profiles for which the engineering properties are missing for both the 1976 and 1995 calculations. LP360 made it possible to measure about 100 profiles in only a few weeks where the same work in the field would’ve taken all summer! The bluffs have definitely become more stable since 1995. In 1995, of the 105 profiles analyzed to date, the slope with the highest value of the lowest factor of safety was 3.30, but in 2012 that value was 3.82. In 1995, 54 of the 105 profiles had lowest factor of safety’s greater than 1.00. In 2012 81 profiles had lowest factor of safety greater than 1.0. Of the 105 profiles that were analyzed from 1995 and 2012, 71 increased their lowest factor of safety, thus becoming more stable. 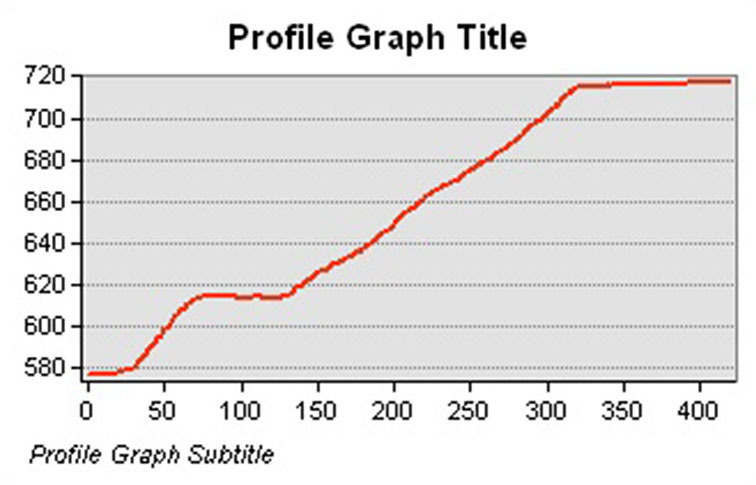 Of the 105 profiles, 29 became less stable. Five profiles had the same factor of safety at both times of measurement. This project has analyzed slopes from the Wisconsin – Illinois state line north to the city of Port Washington. In summary, LP360 made it possible to measure about 100 profiles in only a few weeks where the same work in the field would’ve taken all summer! This allowed much more time for compilation of data and later analysis. In addition, our profiles are now located in a GIS.